Here, I´ve compiled a list of books that apply Positive Psychology to the realm of “the organization”, leadership, management etc. As always, I see the list as work in progress and will be happy to include your suggestions. When making suggestions, please stick to books that have a clear link to Positive Psychology and are (by and large) backed by research. A couple of days ago, I wrote a post about Positive Organizational Capital as introduced to the Positive Psychology community by Fred Luthans. Today, I´d like to point you to another concept based on Positive Organizational Scholarship (POS), precisely: (Positive) Energy. I´ve already touched upon that topic quite a while ago – when introducing some of the work of the marvelous Jane Dutton. Below, you´ll find a 3-minute video of Kim Cameron, one of the founding fathers of POS. He talks about the concept of (Positive) Energy, and how to assess and manage it – and why it´s crucial when being in a leadership role. Is it an uplifting experience when working with colleague XYZ? Do I feel elevated when being around this person? The goal is too have as many people “on board” where you can answer those questions with “yes”. You can read more about the concept of energy in Jane Dutton´s book Energize Your Workplace. And please also check out the work of Esa Saarinen on Systems Intelligence. I guess I´m suffering from MAPP deprivation. The Penn graduation ceremony seems like a long time ago – even though it´s only been three months since then. And now that I´ve handed in my master thesis I´m free to do whatever I want. But the truth is: I miss my stays in Philadelphia. And I miss my MAPP classmates. Time to engage in some reminiscence. 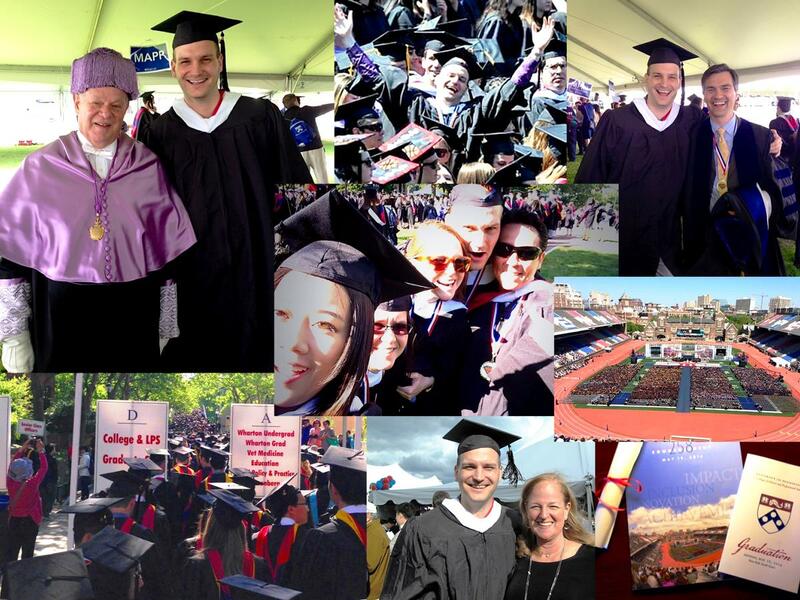 Below, you´ll find a collage from graduation weekend (click to enlarge; from left to right and clockwise: Martin Seligman, co-founder of Positive Psychology and me; standing out from the crowd; James Pawelski, academic director of the MAPP program at Penn, and me; a view of Penn´s stadium during commencement; commencement brochure etc. ; reuniting with Linda Matesevac, my psychology teacher from 19 years ago; the “Walk of Honor” on Penn´s Locust Walk; middle: me and some MAPP cohort members). And you should definitely check out Penn President Amy Gutman´s salutation – and the fabulous commencement speech given by Penn alumnus and Soul & R´n´B star John Legend (“All in on Love”; here´s the full text). Enjoy! Yeah! It´s finally online. Over the last couple of weeks (and including reading and preliminary research, over the last 8 months) I´ve been working on my MAPP Capstone thesis. Now, it has been published in the Scholarly Commons section of Penn´s homepage. You can download the PDF for free here. The term self-permission refers to a belief about the self that a person can hold to a stronger or weaker extent. Self-permission, in short, is the answer an individual gives oneself when asking about their perceived allowance to reach overarching long-term objectives, such as having a fulfilling career or enjoying a lasting and gratifying relationship. At a broader level, the question is whether a person allows him or herself to lead a happy and rewarding life. 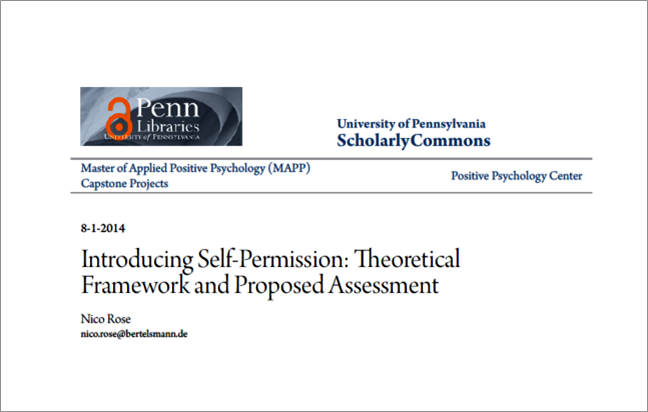 This paper describes the concept of self-permission, explores its nomological network and possible antecedents and consequences, proposes a corresponding self-permission scale (SPS), and suggests a study for assessing 1) the psychometric properties of that scale, 2) its relationship with conjectured adjacent constructs, and 3) its relationship with psychological functioning. Considering how important it seems to be to most individuals to make the best out of their lives and to live up to a deeply felt sense of purpose, a better understanding of self-permission could significantly benefit the psychological well-being of many people who do not allow themselves to thrive. The Little Guru wishes you a HAPPY Day! The P in Marty Seligman´s PERMA framework of Positive Psychology stands for Positive Emotions. According to Barbara Fredrickson´s Broaden-and-Build theory of positive emotions, regularly experiencing sentiments such as happiness, joy, and anticipation is a sign of psychological well-being, and potentially even a pathway to creativity, success across different areas of life, and overall health. So here´s a friendly reminder from my son, the Little Guru, to stay HAPPY! Have a great day! 365 days ago, I started Mappalicious as a kind of diary while being in the 2013/14 Master of Positive Psychology (MAPP) cohort at the University of Pennsylvania. By now, the program is over – and there are 181 blog entries which means that I blogged something roughly every other day. I´m a little bit proud of myself for being so diligent. My Top 20 TED(x) Talks on Happiness, Well-Being, Meaning & Co.
My blog also consists of 12 permanent pages by now. Apart from the “Home” section, my list of seminal Positive Psychology articles has the most views by far.